Heading to Early Access this September. Remember Bloodline Champions? 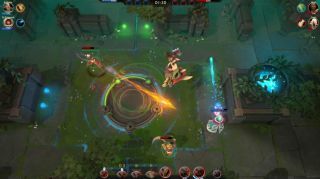 You know, the 2011 free-to-play Dota-styled MOBA that Tom once said had a “steep learning curve and lack of starting characters” but also boasted “fun and frenzied arena battles.” Well its creators, Swedish outfit Stunlock Studios, have now released the first in-game footage of its “spiritual successor” - Battlerite.